If you think you know yourself or are unclear of how to see the real you, this engaging, interactive and fun coaching/workshop will enable you to see, understand and love who you really are. You will gain new insights into how you really want to be with yourself and with others, in all aspects of your life. represents your negative thought patterns. 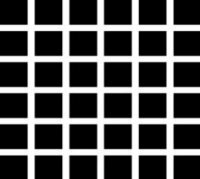 If you look over the grid you will notice grey dots at all the intersections. They represent your negative beliefs, critical thoughts and problems. See what happens when you focus on a particular negative thought - it disappears. The belief never really exists except as a concept in your head! When you shift your thinking you consciously change your beliefs and how you see life. Learn to let go of your need to be right. How and why we limit our potential by what we tell ourselves. An understanding of living as a truly conscious human being. The way to create great relationships. How to focus on your true path that will not feel like work. Using and understanding communication as a way of being who you really are. Can you see the question in the section below? Do you ever have times when you wish you were doing something else, not daring to move towards living your dream for fear of changing or losing the way things are? Or on the other hand, are you so comfortable in your life the way things are that you would never dare to consider doing things differently also for fear of losing what you think you have? Either way, the truth is, wherever you are, whatever you are doing, whoever you are with, right now is the perfect place to learn more about who you really are! Even when you are lacking focus and clarity about where you want your life to go, you have right here and now the capacity to be successful, happy and fulfilled (or even more so) in every area of your life. The problem is, if you are looking outside of yourself, (for your ideal home, ideal partner, ideal lifestyle etc) that suggests you are not content with just being who you are. And do you really know anyway? If you are always looking 'out' for happiness, you will never get to see within, where you true and happy self resides. Is what you are doing more important that who you are being? It will seem that way if you look externally for your success and happiness. If you rely on people and events to make you feel happy and content, especially if you hold on to the idea that you need them to feel happy and content, you will never BE TRULY HAPPY. There will always be that nagging doubt and the thought 'is this it'? Well in a way yes, this is it and as far as we can tell, this is not a rehearsal, the curtain is up and you are playing the lead role and only you know which act you're in! Your whole life is about relationship. Your relationship to everything around you and primarily your relationship with yourself. That is what this coaching is all about. Do You Care? Or Don't You - Your Choice. Can you imagine what the quality of your life will be like when you have a greater understanding of where that quality of life really comes from? We all have the answers waiting to be discovered even when we feel like we haven't got a clue. The problem is we are becoming lazy about creating our own happiness and will always blame other people or events when 'things' don't work out. Remember, if you always blame you will always b-lame! For further details on booking a coaching session, call Gary on the 'contact us' page.